Founder of the company is Anke Domaske who originally was searching for chemically untreated clothing for her stepfather with cancer. Eventually milk proteins came to her interest. Those had already been processed to textiles in the 1930s, but the fibers were treated with various chemicals and produced in a complex process. Qmilk started as a classic start-up – however not in a garage, but in a kitchen. Since the company and development is not a university spin-off, there initially was no laboratory to work in, just the idea to develop a fiber that is chemically untreated. The necessary equipment was bought in a grocery store and built into a lab for about 200,- Euros. Since they initially did not even have a thermometer, they bought a large jam thermometer to measure the water temperature. 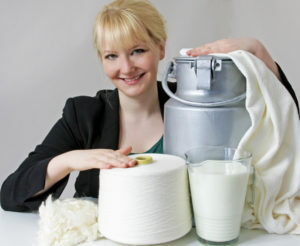 In April 2011 the Qmilch GmbH was founded. There now are a group of companies – Qmilk IP GmbH, Qmilk Holding GmbH and Qmilk Deutschland GmbH – which are engaged in the production and development of biopolymers, based on milk proteins and other natural and renewable raw materials.